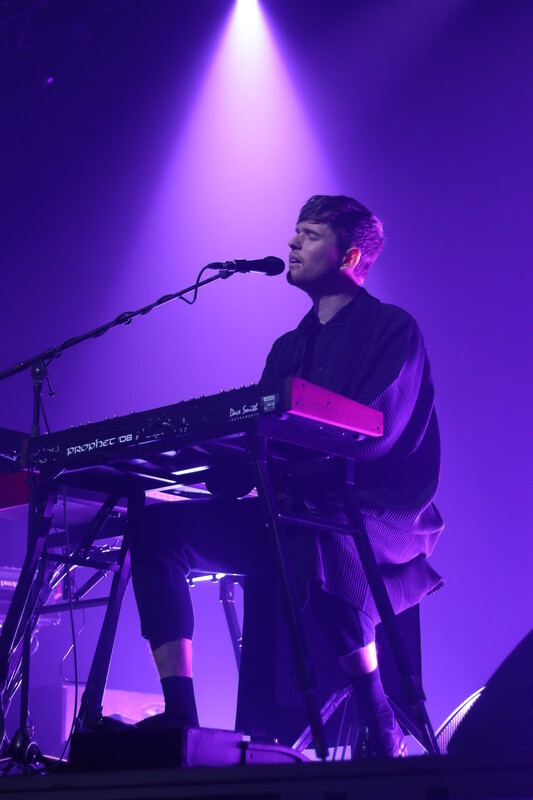 English singer-songwriter James Blake performs songs from his newest album Wednesday evening at the House of Blues in Boston. James Blake, best known in the U.S. for his 2013 single “Retrograde,” held a concert at the House of Blues Boston on Feb. 20. The spectacular performance highlighted his wide array of talents, from his soulful singing to electric R&B beats. Throughout the night, Blake managed to transform the atmosphere of the concert hall from quiet and anticipatory to pulsing with the aura of a techno club. Blake started 2019 with his new album “Assume Form” and the hit single “Mile High” featuring Travis Scott and Metro Boomin. The concert in Boston was part of his North American tour planned for January and February. The tour featured songs from his latest album as well as new arrangements of a few of his classics. Before Blake took the stage, however, the U.K.’s emerging star and Blake’s opener Khushi started off the night with some soft R&B and electronic beats to prepare the crowd for the show that was to come. Khushi’s set featured “Freedom Fall,” the track that marked the producer and songwriter’s return to the industry after a lengthy break. Blake started off the night with his album’s namesake, “Assume Form,” letting his rich, soulful voice fill the concert hall and melt any lingering anticipation. Gleaming green hues and flashing strobe lights intersected with the vapor of the fog machine, spreading across the stage such that Blake sublimely emerged from the smoke. The mystifying atmosphere was complemented by Blake’s still figure as he sat at his keyboard and let his voice ring through the crowd. Engrossed in his music, he sang with such a passion that the audience could feel the wave of fervent emotions stemming from his lyrics. This mystical feeling is emblematic for the artist, who began his music career producing DIY records in London in 2009. 10 years later, Blake’s sound is a staple in the music industry. He solidified his career with a 2014 Grammy nomination for Best New Artist and high-profile collaborations with Chance The Rapper, Beyoncé, and Drake, among others. His participation as co-writer and performer in Jay Rock, Kendrick Lamar, and Future’s hit single “King’s Dead” from the “Black Panther” soundtrack in January 2018 nabbed the artist a Top 40 in US charts. The night continued with Blake switching between old and new songs, starting with “Life Round Here” and his 2016 hit, “Timeless.” The entire venue stayed incredibly lively and attentive and as Blake alternated his electronic beat with soulful vocals. The musician himself occasionally got up and spoke directly to the crowd. Noteworthy was Blake’s performance of “Mile High,” during which he flexed his experimental skills on the DJ set to put a live twist on the hit song. Still, the night wasn’t over yet. The crowd’s chants of “Encore!” brought Blake back out on the stage to perform two more awe-inspiring songs: “Don’t Miss It” and “Lullaby For My Insomniac.” Blake concluded the show on a mellow and feel-good note, leaving the room kindled in the fading light of the best Blake had to offer.